Honey is a sweet, viscous food substance produced by bees and some related insects. This healthy natural sweetener offers many nutritional and beauty benefits, and that’s why it is also called “The liquid gold”. You will be surprised how many positive effects this powerful natural ingredient has on your skin, hair and nails. So, next time you’re purchasing your beauty products, just look for an organic raw honey. Honey contains antibacterial and antifungal properties that stop bacteria that can cause acne and breakouts on your skin. It also has anti-inflammatory properties that can reduce redness and irritation. How to use it: Apply some raw honey to affected areas, and leave it on for about 10-15 minutes. Rinse with lukewarm water. Honey has the ability to penetrate deep in the skin ad provides long-lasting hydration. 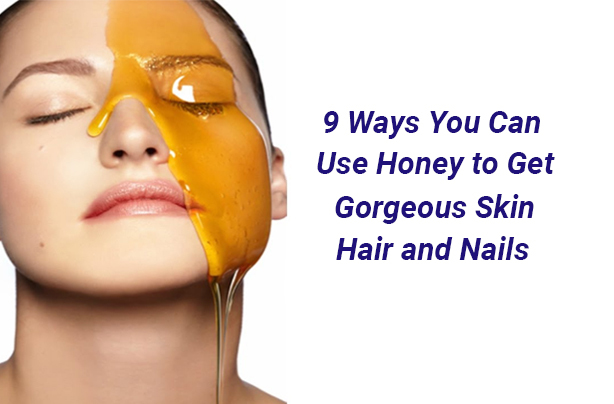 How to use it:Apply one teaspoon of raw honey on clean, dry skin, and leave it on for about 15-20 minutes. Rinse with lukewarm water. Honey contains powerful enzymes that cleanse your skin and pores. It also prevents bacterial build-up that can lead to skin imbalances and breakouts. How to use it: Mix 1 tbsp. of raw honey with 2 tbsp. of jojoba oil or coconut oil. Apply this mixture to clean, dry skin, and massage gently using circular motions. Avoid the skin around your eyes. Rinse with lukewarm water. The anti-inflammatory and antibacterial compounds in raw honey can lighten your skin and decrease the appearances of scars and increase healing and tissue regeneration. How to use it: Mix 1 tsp. of raw honey with 1 tsp. of coconut oil or olive oil. Apply this mixture to the affected area. Gently massage your skin with the tips of your fingers using circular motions for about 2 minutes. Place a hot washcloth over your skin, and let sit until cool. Repeat this method every day to see the results. Honey contains powerful antioxidants that can repair your skin and protect it against oxidative and environmental damage. How to use it: Mix 2 tbsp. of raw honey with one cup hot water until dissolved. Add to a tub of warm water, and soak. Raw honey is rich in nutrients and enzymes that nourish and heal your skin around your nails. How to use it: Mix 1 tsp. of honey with 1 tsp. of apple cider vinegar and 1 tsp. of coconut oil. Rub this mixture over each cuticle, and leave it on for about 10 minutes, then wash your hands. The enzymes and nutrients found in raw honey makes your hair shiner and healthier. How to use it:Mix 1 tbsp. of raw honey with 2 tbsp. of coconut oil. Apply thoroughly to the bottom two-thirds of damp hair, starting at the ends and going up. Leave it on for 15- 20 minutes, and rinse your hair well. Honey contains an enzyme called glucose oxidase which can slowly releases hydrogen peroxide, an ingredient known to lighten hair colour. How to use it: Mix 3 tbsp. of raw honey with 2 tbsp. of clean water. Apply this mixture to clean, damp hair, and leave it on for an hour. Rinse well. Use this method once a week to see better results. The humectant properties of honey help regulate and retain moisture in the hair. Honey also strengthens hair follicles for healthy growth. How to use it: Mix 1 tsp. of honey with a dime-sized amount of your favourite shampoo. Wash off your hair as you normally do.